Just before I close down my sewing room until the new year, I'm preparing 3 or 4 of the larger blocks of the Snowmen A-Zzz pattern. I learned from the last big stitching project, not to leave the large blocks to the last. This time, the large blocks will all be done first. I'll be using different DMC floss colors in this project instead of just doing redwork. I think it will add a different look and keep it interesting as I stitch along. My sister gave me three nicely organized boxes of floss a few years ago. 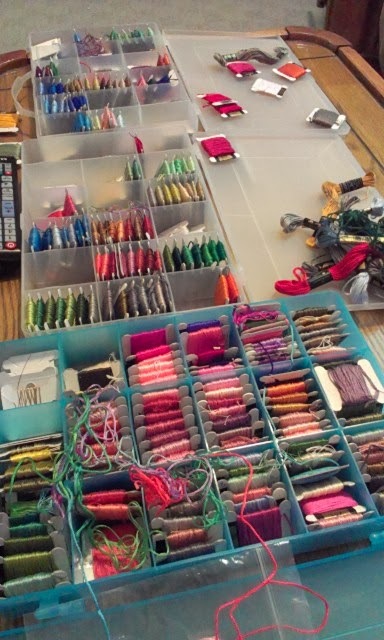 The kiddos have made many many friendship bracelets out of those boxes of floss, and there is still so much left. Well, I never thought I'd be doing a big stitching project like this that needed so many colors. So, I'm glad I've got them. Thanks so much Donna!! So after today, my other sewing machines will be covered for their winter hibernation. And blogging will resume from points south, in the New Year. As you know, I love making small projects. I've been making little zippered bags for some time. All kinds of nice detailed techniques. 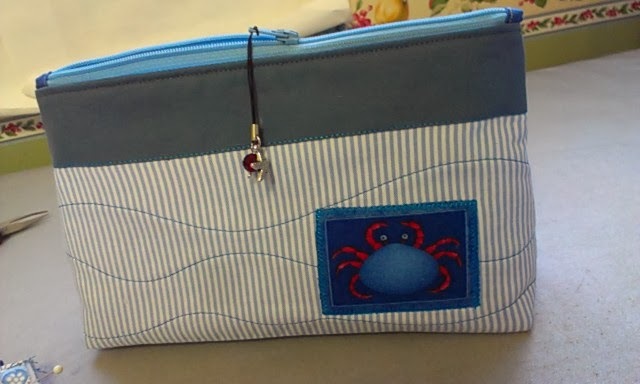 What is different about this little zippered bag, is that after boxing the bottom corners, it is the same width at the top as at the bottom. I do like shape of this bag. On previous projects I learned how to do the zipper ends, so the corners of the bag don't cave in. I like adding a little themed fabric patch to a project. A little zipper pull is a must. It doesn't have to be too fancy. And now, added to my likes, is the shape of this bag. I have a small collection of what I call seaside colored and themed fabrics and thought this was a perfect time to try this color combination. 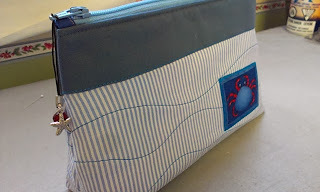 This prototype bag is almost nine inches wide and has a depth of about two inches at the bottom. A little starfish and red crystal on the zipper pull adds a little interest. To a second prototype bag, I added a pocket panel to the inside. It won't take 15 minutes to finish up this bag. These will go into the cupboard for a quick gift or for a craft sale donation. Now that my church quilt is behind me, I'm sewing small projects this week. 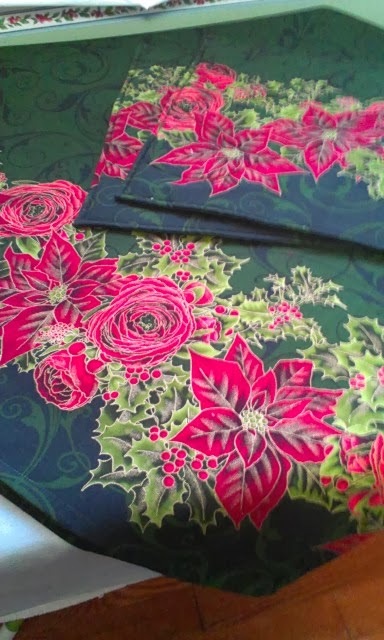 Using a really nice border print from Fabricville, I made a square tablecloth. A bit of leftover fabric made two placemats. It's for Patience. She will be making Christmas dinner for her family and future in-laws this year. The center is a nice rich green with a slight swirly pattern. A perfect place to set her Christmas turkey. It's all freshly ironed and and folded to hang over my railing. It's called "A Vintage Nine-Patch". St. Dunstan's 2014 raffle quilt is done, and ready to deliver. 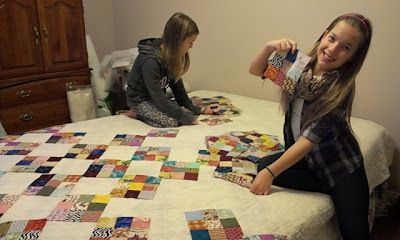 The vintage quilts used to be made out of re-purposed cloth and favor was not given to pattern or color matching. Utility and function was the name of the game in the old days. It's charming, don't you think? 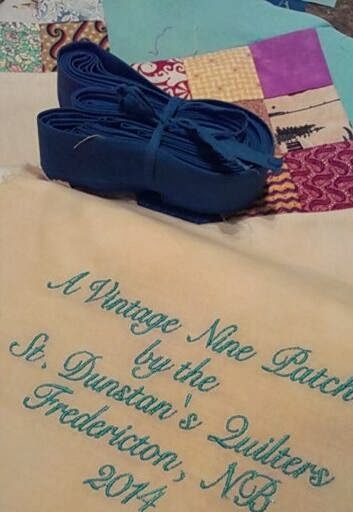 The label was stitched in a blue thread to match the setting triangles and bias binding is all made and freshly ironed and it's hanging along the right side. It's a darker shade of blue and should frame the quilt quite nicely. After Christmas, this quilt will be hand quilted by the St. Dunstan's quilters with straight lines for an authentic look. Since they know I'm delivering this quilt to them today, the quilters have invited me to a Christmas Mass followed by a luncheon. 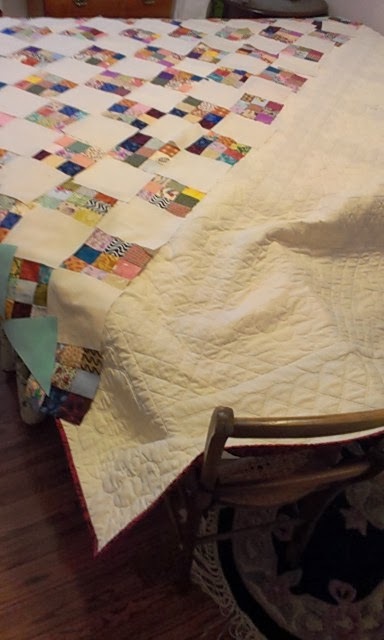 For me, such a nice way to hand over the quilt. I saw a picture on Pinerest months ago and the idea to use an old frame was here. After finishing our kitchen painting this fall, I did not hang back up an old key holder that held our less frequently used keys. But those keys still need a home. 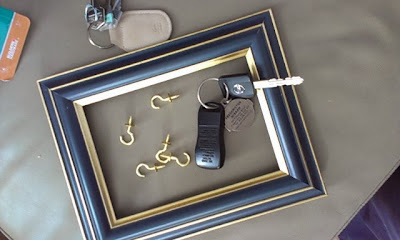 I came across a small frame recently that was perfect for this little diy project. I threw out the artwork, and the glass from the frame. All that is required is the wooden frame with a hanger on the back. I bought a package of 7/8" screw in cup hooks. 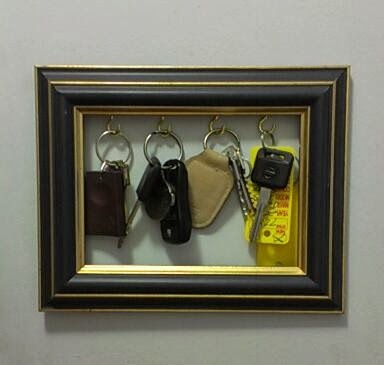 Measured carefully to space them evenly, and in 10 minutes, we had our new key holder up on the wall. And here you have it, our keys in the downstairs entryway. It was this time last year that I made these little fox scarves for the kiddos. I thought how fun they are with the little legs dangling etc. 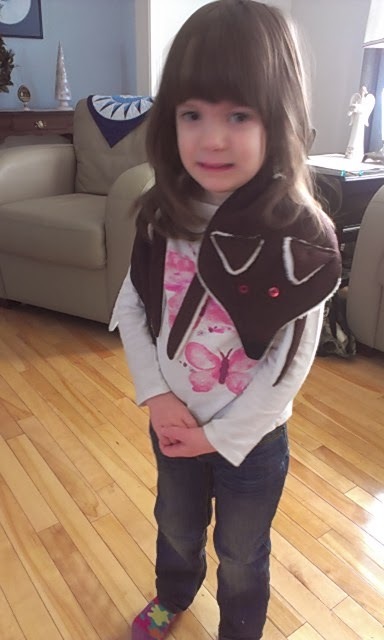 Here is Aurora modelling the fun fox, but she just did not get it!! It was just weird to her... haha..
Of course young kids will not really get the fun of it because they would not remember the old days when women wore fox stoles. But just the same, I had fun making them. Well this year again, we are talking foxes. A real one who has found a special sunny spot in our back yard. He has been around for a few weeks now, but only on sunny days. Aurora says her kitty cat is like the little fox who just loves the sunshine on a cold day. Cute eh! When the kids came today to make our Christmas Gingerbread, I was all ready. The giant batch of dough was made yesterday, divided into four rounds and was cooling overnight in the fridge. 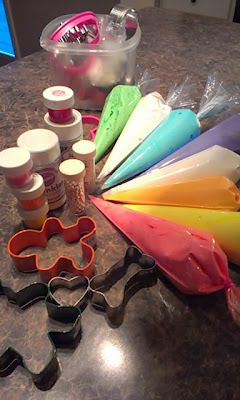 The 8 bags of colored royal icing always looks so good before the kiddos get their hands on it. The sprinkles, sparkles and other cookie decoration were available just in case the icing was not enough. I just love this day with the kids. Have a look at lots of pictures from the day. 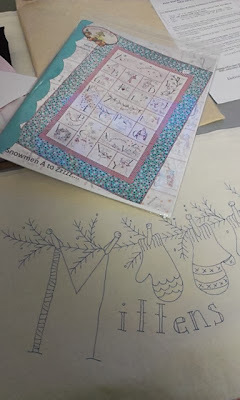 Our Cotton Mill Quilt Guild's Silent Auction and Christmas Luncheon is on Monday. 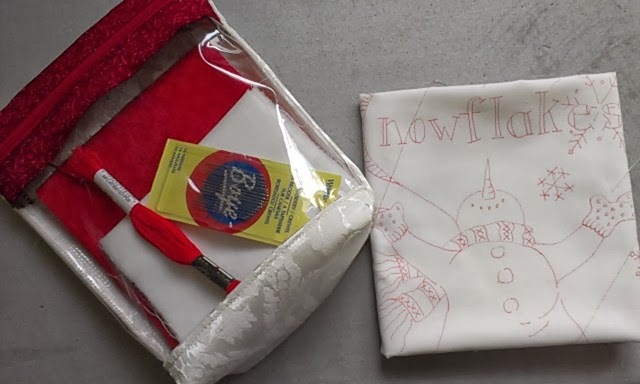 I made several small items for the auction and one of them is this little stitching kit. "S" is for Snowflakes. It's actually one block of the Snowmen A-Zzz pattern by Crabapple Hill designs. 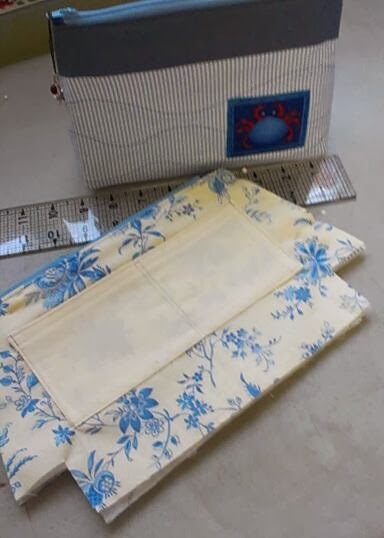 Besides the traced pattern on fabric, the kit has finishing fabric, embroidery needles, red floss, written instructions on how to finish the wall hanging with a checkerboard border and finally, a little see-through zippered tote to carry it all in. I know if somebody bought it as a gift for me, I would love it. I hope it brings in a good price. 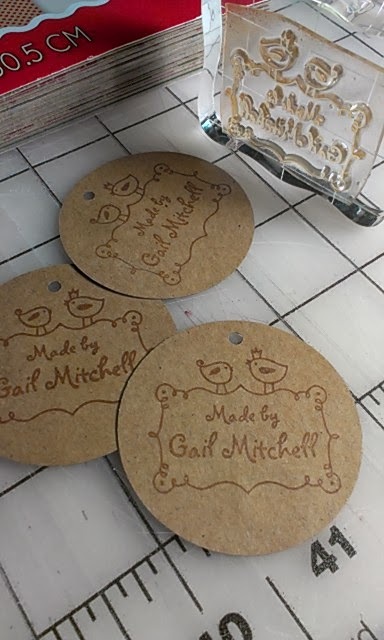 Remember I told you a few weeks ago about getting rubber stamps made so I could make small fabric labels for the little projects I make. Well, I had not thought of it before, but this week I had fun using the stamps in a traditional way. I cut out paper circles and using them to stamp a tag to put on the auction items. I like it and it finishes off the crafty items really nice. My church quilt is coming along nicely. I didn't set too big of a goal for this week because I knew I was busy. And I did accomplish what I set out to do. I used our spare bed to lay out the blocks in the right order. The side triangles were cut and placed in the layout. The binding is done and ready to go. 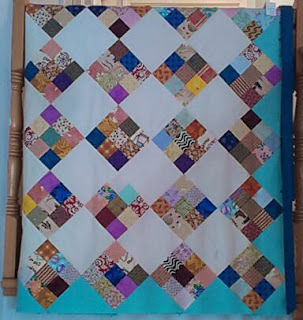 I did get a start on sewing the blocks together. The other half of the blocks are stacked in the correct sewing order, and I'll start sewing on them tomorrow. 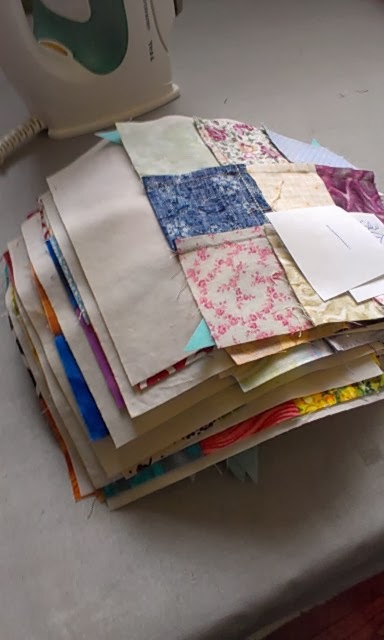 When I look at my stack, I always thank my lucky stars for Eleanor Burns technique of laying out quilt blocks and her stacking and sewing method. I learned it from one of her early Quilt in a day books. It's such a time saver. This is another busy week coming up, but I'm positive that I'll have the remaining blocks sewn into rows and pressed to the dark side. This will be followed by pinning the rows together, sewing and then a final press. The last thing I need to sew will be to design and stitch a label. I'm hoping to have it done for Thursday, but if not, it'll be done for the following Thursday which was my goal a month ago when I started this project. Come back next Friday, when I'll show you what this classic nine patch looks like all sewn together. You might think that the kids are helping me make cookies today. But no, it's just me. 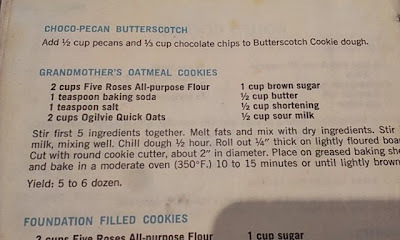 I thought I would try to make some of those old fashion oatmeal date filled cookies. I've bought them in stores, and I remember that my late sister-in-law Zelda used to make them. My husband and her husband who are brothers, used to rave over them. Well here's what I tried.... Using the recipe below out of an older Purity cookbook, I tried making square oatmeal cookies, then putting a dollop of date filling in the center, then another square on top. They were just too big and thick. Next, I decided I would cut out rounds, put a dollop of filling and pinch them up on three sides to make sort of a thumbprint cookie. 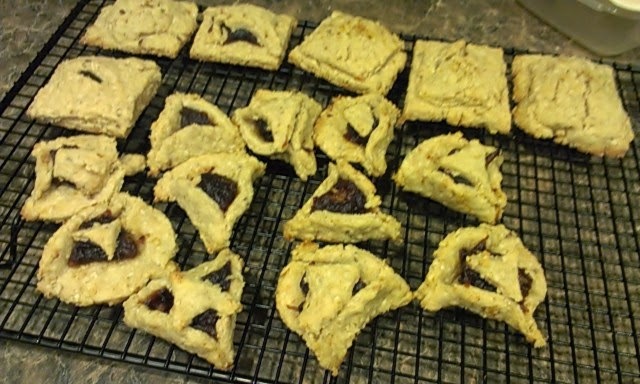 That didn't work, so I thought I'd use up the bits of rolled dough in the centers of the thumbprint style cookies. It's just keeps getting worse and worse. Ha ha... when I look at this picture, I just can't believe how ugly they are. These cookies never got the raves that Zelda's got, but you know, they are all gone now. So they tested a lot better than they looked. 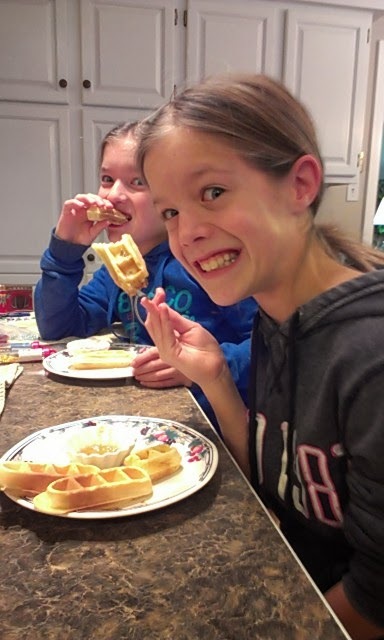 The girls were over for a sleep-over visit over on the weekend while Mitchell was away playing in a hockey tournament in Moncton. 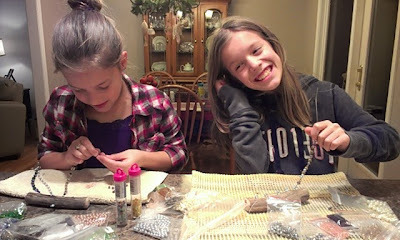 We got right into a beading project. Poor little Grace, on the right, had a case of the A.D.D.s. I had fun teasing her. She could not work on the beading for even a minute and she had ants in her pants. She has the irresistible need to sing and dance. Later on, we watched a couple of movies before tucking them in for the night. In the morning after a breakfast of waffle sticks and syrup, I had them help me lay out a quilt. 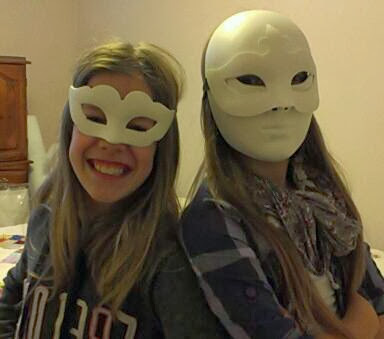 This is something that Caitlin and Grace are good at. But even this got to be too much for them. Hmmm I think these little girls are growing up too fast.